Hi Everyone, Kristina here! This die has just been begging me to make it into a shaker card since I got it. 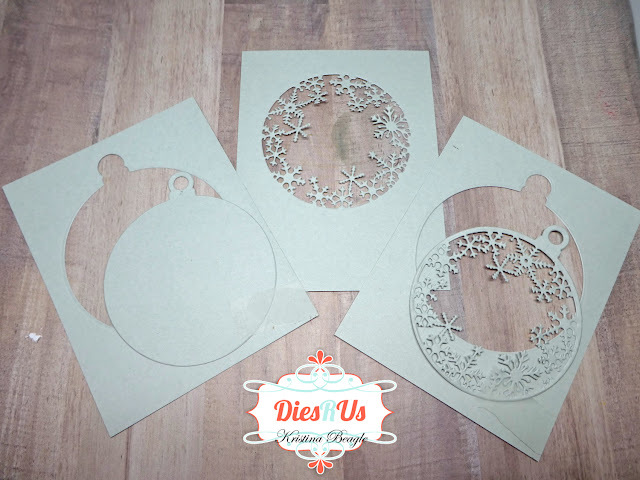 This was my first time using the snowflake ornament fancy die. 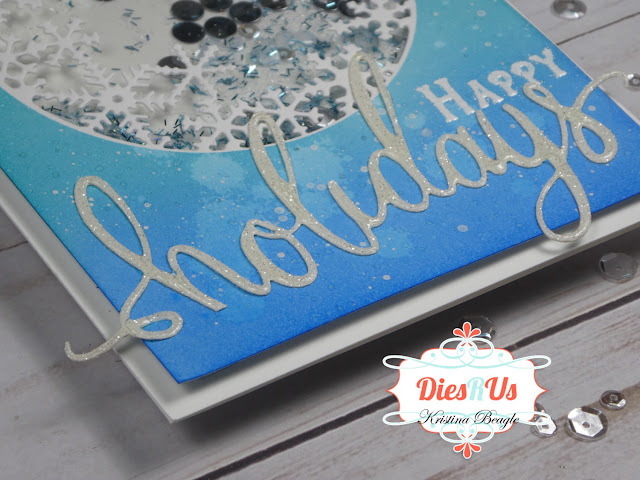 This is a two piece die that can be used multiple different ways. Whenever I get a multi use die like this, the first thing I like to do is cut it out of some scrap paper in all of the different possible combinations so I can see exactly what my options are. With this die you can cut either a solid ornament, a snowflake ornament, or like I did just cut the snowflake circle edge. 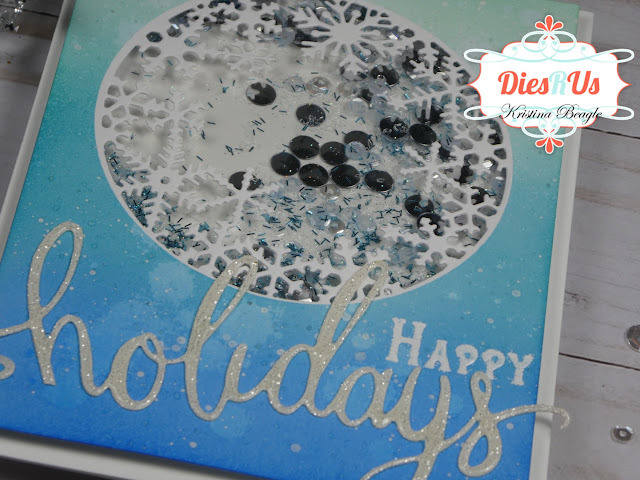 Starting with a a2 sized card front, I used a circle that matched the size of the snowflake die, to cut a mask from avery removable label paper and placed on the center of my card front where I would later cut out the snowflake die. Now it was time to cut out the snowflake die. I lined the die up into the white space left behind from my mask, and ran through my die cutting machine. I adhered a piece of acetate to the back to be my shaker window. Now the fun part, filling the shaker! I added into the shaker window blue/silver/white sequins and glitter. To seal it all in I add another piece of acetate adhered down to the fun foam, and lastly I adhere the whole shebang down to an a2 sized card base. Then it was time for my sentiment. I had to keep the sparkle going so I die cut the Hero Arts Holidays Fancy Die from some white glitter card stock and adhered it down to the card front before lining up and stamping a "Happy" from a misc. stamp set in my collection, which I heat embossed with white embossing powder. 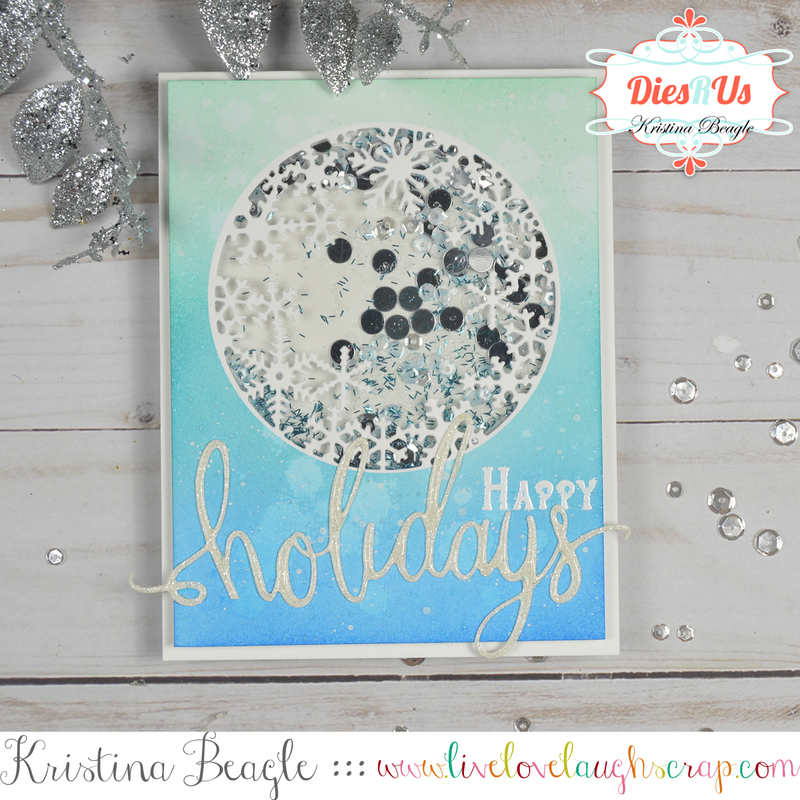 I wanted a little more dimension, so I coated the "Holidays" with glossy accents. Thanks for stopping by today! I hope you'll join me on my crafty journey, find more crafty fun on my Instagram and Facebook Page!